Sleep Apnea can be easily treated, allowing a senior to regain their health and active lifestyle. Your whole life you've been told you are a horrible snorer. Could it be more? Sleep apnea in elderly patients often goes undiagnosed, or is diagnosed simply as snoring. Difficulty falling and staying asleep, combined with a lack of deep sleep, result in a poor quality of life and increased health risks for a senior. Learn the symptoms and ways to treat sleep apnea in seniors so you can get the perfect night's rest. A study by the National Institute on Aging reports that over half of study respondents over age 65 reported sleep problems or excessive daytime sleepiness. These sleep problems may be caused by a variety of factors including medications, body aches and sleep apnea. Individuals who have sleep apnea temporarily stop breathing during sleep - called an apnea. A person with this condition stops breathing at least five times an hour for approximately 10 seconds each time. In order to start breathing again, the person may gasp for air even though they are still asleep. This type of sleep apnea is the most common and is caused when the muscles and tissues in the throat and air passages relax during sleep, which slows or stops the air flow into the lungs. This absence of air causes an apnea as well as snoring. This less common form of sleep apnea is caused by an imbalance in the respiratory-control sections of the brain. The brain does not respond to the normal triggers that would cause a person to take a breath. A senior may have a variety of sleep and health issues that may not be diagnosed as being the result of sleep apnea. A sleep study during which the actual sleep patterns are monitored is the only way to determine whether a person has the condition. Prior to the 1980s, obstructive sleeve apnea was rarely diagnosed. Patients were usually just thought of as "snorers." The only available treatment was surgery on the trachea (windpipe), into which a breathing tube was inserted. In 1981 the first treatment for sleep apnea was available in the form of a Continuous Positive Airway Pressure (CPAP) machine. With this treatment, air is blown into the patient's nasal passage to keep the nasal passage open. 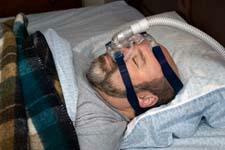 Most patients find immediate relief after the first night of sleeping with a CPAP machine and a nasal mask. In addition to a CPAP machine, some seniors with sleep apnea might find it easier to sleep if their bed is adjustable. This will allow them to elevate their head which will allow them to breathe easier. And, if they have other medical problems, they may also enjoy the benefits of leg elevation. Seniors typically have more health and wellness challenges. With a concentrated effort towards a healthy life, a senior has a better chance to enjoy a longer, fuller life. Sleep apnea in elderly patients can add to the challenges facing a senior. The lack of deep sleep results in a variety of health and safety risks. A person with undiagnosed sleep apnea is at least six times more likely to have a car accident. The drowsiness caused by the condition, combined with a potential slow down in the senior driver's reaction time, can greatly increase the driver's likelihood of a serious or fatal accident. Some seniors have been denied a driver's license because of poor driving reactions and accidents caused by sleepiness at the wheel. Once a senior has had his or her sleep apnea diagnosed and are under treatment using a CPAP machine, it's possible to be retested by the Department of Motor Vehicles.